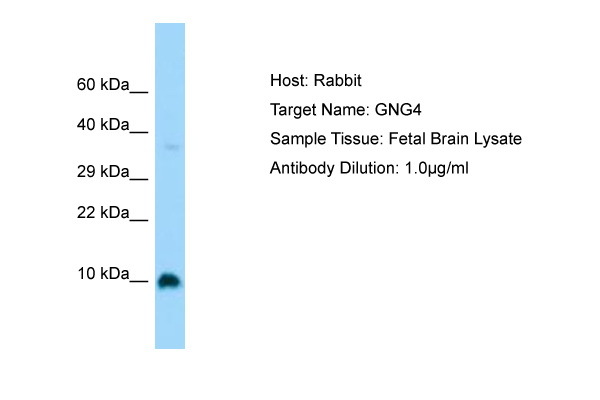 GNG4 antibody LS-C169976 is an unconjugated rabbit polyclonal antibody to GNG4 from human, mouse, rat and other species. Validated for WB. 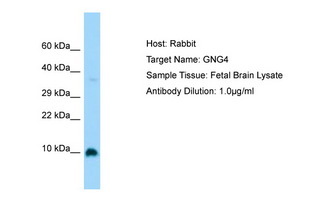 GNG4 antibody was raised against synthetic peptide from C-Terminus of human GNG4 (P50150, NP_004476). Percent identity by BLAST analysis: Human, Chimpanzee, Gorilla, Orangutan, Gibbon, Monkey, Galago, Marmoset, Mouse, Rat, Elephant, Panda, Dog, Bovine, Bat, Rabbit, Horse, Pig, Opossum, Guinea pig, Turkey, Zebra finch, Chicken, Platypus, Lizard, Xenopus, Trout, Salmon, Smelt, Sablefish, Stickleback, Medaka, Pufferfish, Zebrafish (100%). Immunizing peptide used to generate LS-C169976. Useful for pre-absorption and neutralization of the antibody's antigen binding site.